Developments from the Maldives of the new Hulhumalé Yacht Marina continues, reports Asia Pacific Superyachts Maldives director, Mohamed Hameed. The marina, to be part of the coastal island most ambitious and extensive new development ever in the Maldives, will be a boom for visiting vessels. The APS Maldives yacht services agency works closely with arriving superyachts and is closely monitoring the progress of the new yacht marina. Hameed says the Hulhumalé Yacht Marina plan is good news for future visiting vessels as the Marina will service 300 yachts and provide numerous attractions and benefits for arriving yachts. This year yachts using the services of Asia Pacific Superyachts Maldives as their local agent includes some stunning superyachts. Among the visiting vessels were M/Y April, M/Y Batavia, M/Y Five Angel, M/Y Galeocerdo, M/Y Kogo, M/Y Liberty, M/Y Meamina, M/Y Sea Rhapsody, M/Y Silver Angel, M/Y Silver Fast and M/Y Talisman C.
The Yacht Marina is part of the coastal island proposed for the western side of Hulhumalé Island and will cater to the needs of yachts and safaris. 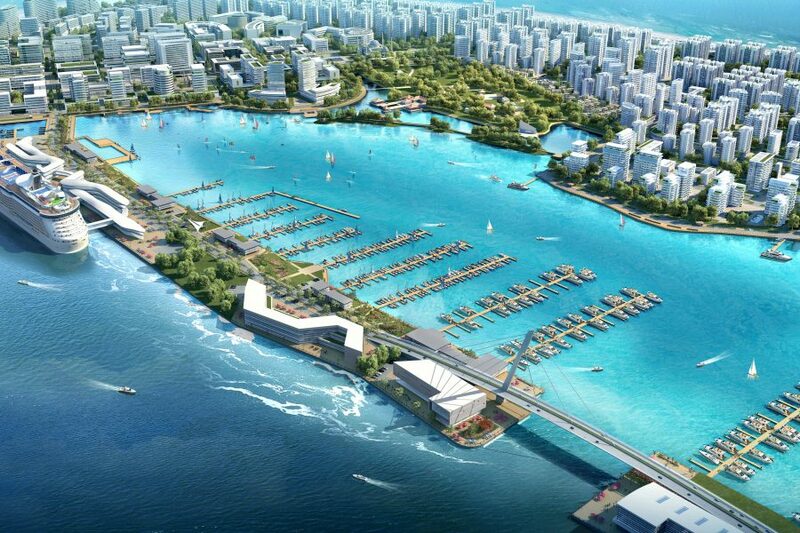 According to the HDC, apart from water sports facilities, the marina will have amenities such as retail shops, F&B outlets and a yacht club that includes exhibition space, dry berth facilities and boating dock. There will also be a modern fully equipped cruise terminal located right next to the marina with an automatic, covered boarding bridge to facilitate cruise lines visiting the Maldives. Globe Newswire (London) recently published the following news of Hulhumalé Island: 8km off the northeast coast of Malè, the capital of Maldives, lies Hulhumalé, the country’s biggest and most ambitious city development. The city of Hulhumalé was reclaimed with the aim of relieving the congestion and housing challenges facing the Maldives. The plans will effectively centralise the small island nation’s population, while also promising safer homes for migrants from the outer islands. Since breaking ground in 1997 with a total land area of 432 hectares, the city is now home to over 40,000 residents and boasts a multitude of mega projects, the likes of which have never been seen in the country. Managed by the government-owned Housing Development Corporation (HDC), Hulhumalé is en-route to becoming a sustainable city - one that fosters creative entrepreneurship among the country’s dominant youth population by offering modern solutions to tackle social challenges. The city is connected to an international airport, and will soon be complete with a number of new facilities including a water theme park, a yacht marina, a football stadium and an international cruise terminal. The investment will not only improve lives in the short run but is designed to unleash the benefits of a virtuous cycle of investment and economic opportunity. “The new Hulhumalé Yacht Marina will be of enormous benefit to visiting superyachts and yachts”, enthuses Mohamed Hameed and his APS yacht services team, adding, “in the meantime, we have some wonderful itineraries and special anchorages to share with Captains and Owners now”.